UPDATE: Microsoft asks Machinima to label videos as advertising. UPDATE #2: Microsoft has asked Machinima to mark videos made as part of its paid-for Xbox One content deal as advertising, the company has told Eurogamer. The move follows widespread disapproval at Machinima's marketing deals - where users are paid promote brands in their videos without stipulating that they had been paid to do so. "Microsoft was not aware of individual contracts Machinima had with their content providers as part of this promotion and we didn't provide feedback on any of the videos," a spokesperson told us. "We have asked Machinima to not post any additional Xbox One content as part of this media buy and we have asked them to add disclaimers to the videos that were part of this program indicating they were part of paid advertising." ORIGINAL STORY: YouTube users were offered money by Microsoft to speak positively of Xbox One and include footage of Xbox One games in their videos, a new report has revealed. The scheme was advertised to Machinima users via email. There's nothing too surprising about that - YouTube channels often include sponsors or create commercially-motivated content. What is unusual is the extensive non-disclosure agreement that participants were made to sign which forced them to keep their part in the scheme - and its very existence - private. Once signed up, Microsoft promised to pay participants an additional $3 per thousand video views, Ars Technica revealed, in a deal organised through Machinima and offered to its video partners via email. 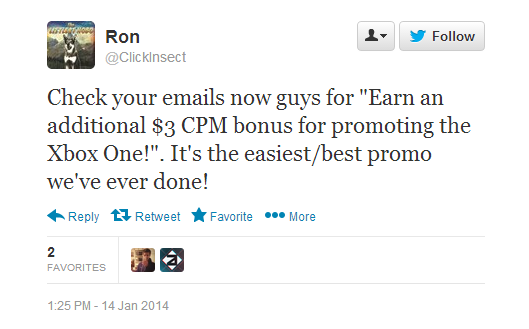 It was also promoted via a now-deleted Twitter message by Machinima's UK community manager. Qualifying videos had to include at least 30 seconds of Xbox One gameplay and have the user mention Microsoft's console by name. A user then needed to tag the video "XB1M13" for Microsoft to find and verify. The deal's full agreement, posted to Pastebin by ReconXBL, reveals that users also had to promise to "not say anything negative or disparaging about Machinima, Xbox One, or any of its Games". The report qualifies the above by saying that the scope of this campaign was minimal in comparison to Microsoft's overall Xbox One marketing push. Microsoft promised to only pay out for the scheme's first 1.25m views - a milestone which was passed on 16th January, just two days after the promotion began. Regardless, the existence of promotional content not clearly identified as such is a troubling prospect. It's clear to see why the scheme would appeal to advertisers, which face a constant battle getting internet users to interact with commercially-funded messages - and that's if users don't just block advertising entirely. It should also be pointed out that, despite the fact that Microsoft has stopped paying for these videos, the company will continue to benefit from their existence, as they remain on YouTube for users to find. US Federal Trade Commission guidelines state that participants in promotional content must disclose "a connection between the endorser and the seller of the advertised product that might materially affect the weight or credibility of the endorsement", something which could arguably be applied here. It's not the first time that Microsoft has tried to woo the YouTube audience - a similar campaign offering an additional $1 per thousand views took place in November. The company also gave away Xbox Ones to high profile YouTube users before the console launched to allow them to start creating content featuring the platform as soon as possible. We've contacted Microsoft for comment on the report and will update if we hear back.